Good looking businesses sell. They create excellent first impressions. Like a magical thing, clients will feel confident and happy to do business with someone that keeps his/her business looking great. And guess where your first chance to captivate clients is? That’s right. It is in your business entrance. You definitely can be the new business sensation by installing modern and sleek revolving doors in Chicago IL. Revolving Doors Create High Value for Your Business! Your building’s front door is the first thing potential clients see. So, we know there is an excellent opportunity for you to make the most out of this asset. You can make your business entrance sleek, modern, and eye-catching to invite potential clients inside. Here at The Chicago Door People, we offer customized, sleek, and modern revolving doors in Chicago IL. Our doors will fit perfectly as part of startling transparent building entrances. Our business mission is to contribute to the success of yours, nothing less. And guess what, our expert door installers will create the perfect entrance system. Without doubts, this will help you attract, captivate, and invite clients inside to do business with you. Revolving doors are and will continue to be a trend in Chicago IL. In fact, Chicago is the number 1 market for revolving door manufacturers. So, it’s an excellent idea to follow the example of many successful businesses in Illinois. With the right revolving door installation, you can fascinate and captivate your potential clients. With customized revolving doors, you’ll be the next business sensation. Your clients will no longer look your business from the outside. Instead, they will feel attracted to give your business a shot. Revolving doors were one of the best inventions for businesses. They are sensationally efficient in keeping fluid traffic flow. Your clients, without doubts, could move in and out of the building in a continuous flow. Of course, you don’t want to make your clients wait. You want them to enter and leave your business effortlessly. Well, calling our certified door crew to install beautiful and functional revolving doors in Chicago IL is a terrific idea. Since 1982, we have worked diligently to make our client’s vision attainable. We are sure your dream is to make your business grow every day. Though it’s no easy, and we definitely can open many opportunities, literally, to your business. Working with us, you can make sure your products or services are highly accessible to your valuable clients. Create the Ideal Business Setting. Make Clients Feel at Home! Well is now time for business. Once your clients step inside your company, you should make them feel at home. You can create the ideal business setting for your clients with our customized revolving doors. 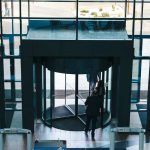 Installing revolving doors in Chicago IL will bring a lot of benefits to your business, keeping it healthy and growing. You will not only reduce unwanted airflow, but you will also make your clients feel at home. As a door company, our expertise lies in commercial revolving doors. And we know that these doors retain heat better than others. They work as an airlock, avoiding drafts. Without doubts, you can make your clients feel great when visiting your business. Warm air. Nice products. Very polite customer service. Indeed, all beautiful. 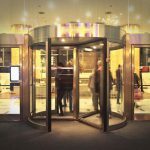 Jazz music will sound amazing, and your clients will enjoy it while staying at your business, all thanks to revolving doors. This type of door does a terrific job reducing noise infiltration. Due to their unique design, revolving doors help to block loud street noises. Your clients will feel just happy to stay inside your business rather than being disturbed by the excessive city noise. Creating the ideal business setting is the ultimate weapon. Your clients will feel confident, happy, and loved. Our doors will help you to achieve all of that so that your clients keep coming time after time to do business with you. Why are We Your Best Option to Install Revolving Doors in Chicago IL? Since 1982, we—The Chicago Door People — have worked hard, diligently, and responsibly to offer you the latest alternatives on commercial doors. Today, we are proud to be one of the leading door companies in Chicago IL. You can count on our high-end and affordable commercial door installation in Cook County, IL. Our team is constantly undergoing training and licensing so that we offer you the best commercial door services, nothing less. Also, you should remember that our job is to keep your revolving doors in Chicago IL working correctly, safely, and effortlessly. We offer maintenance packages that can fit your budget! Stop your search here. We are the best door contractors in Chicago IL. Whenever you need commercial door repair, maintenance, and installation, we are the door company you should trust. Our team is capable and qualified to work to ensure that all the solutions and alternatives we provide are customized and tailored to meet your needs and challenges. Call us today at (872) 206-3485 and get your FREE ESTIMATE on any of our services.